A monster shark is getting ready to rise above the skyline at SeaWorld Orlando. The first pieces of steel track for SeaWorld’s new 200-foot-tall hypercoaster Mako have arrived after traveling nearly 1,000 miles on an open flatbed semi-truck from the production facility in Ohio. Mako will be Orlando’s tallest, fastest and longest roller coaster when it opens in summer 2016. It will reach speeds of 73 mph along 4,760 feet of steel track. 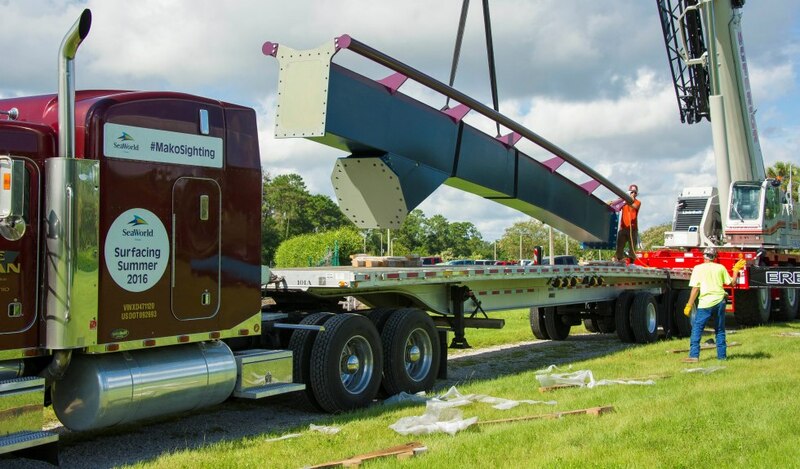 Over time, giant pieces of deep indigo and ocean blue coaster track will journey from Ohio to its destination in sunny Florida. Highway travelers in major cities along the way – including Cincinnati, Lexington, Knoxville and Atlanta – should keep an eye out for this unusual #MakoSighting. Mako is slated to open summer 2016 and will be the centerpiece of a two-acre, shark-themed realm at SeaWorld.